The Little Black Book of Computer Security, Second Edition, which I just released again as a reprint, is now available from Amazon on Kindle. This is my first book on Kindle and, of course, my first experience with e-books. It should be interesting. I've just republished my book, The Little Black Book of Computer Security, Second Edition, which had gone out of print last year. I also reduced the price to $14.95 and made the format a bit bigger -- but it's still a "little black book". The book is available again on Amazon or CreateSpace. I appeared on a TV program last night about so-called "digital pickpockets," who skim and clone credit cards. The program also had a demonstration of how card numbers can be sniffed from RFID cards right from people as they walk down the street. Besides punching a hole in your credit card to remove the RFID chip, as the reporter dramatically showed at the end of the program, the best ways to protect your credit card are still the old-fashioned way -- frequently checking your credit card statements, keeping your card within eye sight and being careful where you use your card. I was interviewed briefly on local television about ATM security. Thieves were allegedly using a master code to steal from ATM machines. The victim, in this case, was the machine, not individual accounts, since the alleged crooks used the code to pilfer the contents of the ATMs and not the accounts of individual credit or debit card holders. 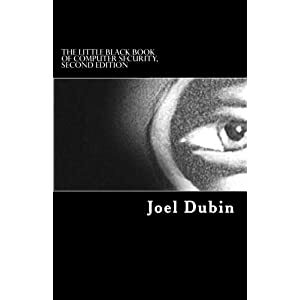 My last television appearance was in 2009, also on a local station, about my book, The Little Black Book of Computer Security, Second Edition. This is another one about the perils of not being careful when using social networks. A security researcher set up a series of fake Facebook, LinkedIn and Twitter accounts, bearing information and a seductive mug shot of a young lady, posing as a Navy cyberthreat analyst. The fictitous flirty little Sage, as the dupe was called, established links with around 300 - mostly men, not surprisingly, but also some women - in the U.S. military, intelligence and information security communities. Some of her new found "friends" even considered offering her a job, according to this story in Computerworld. Interestingly, the flesh honeypot wasn't able to attract any attention from either of the two top notch schools - MIT and St. Paul's, a New Hampshire prep school - listed on LinkedIn to demonstrate her high educational pedigree. It seems the prep schools were a bit more choosy in who they friend. "One of the things I found was that MIT and St. Paul's [prep school] were very cliquey. If they don't remember seeing you, they are not going to click. You had less of a chance of penetrating those groups than the actual intel and security communities," Thomas Ryan, the real person behind the phony social networker, was quoted as saying. The lesson is simple and obvious: If you don't know them personally, don't friend them. No matter how cute, knowledgeable or well-educated they appear. Matahari has now moved to cyberspace.